It’s that time again when we invite you to get involved in Streetworks. 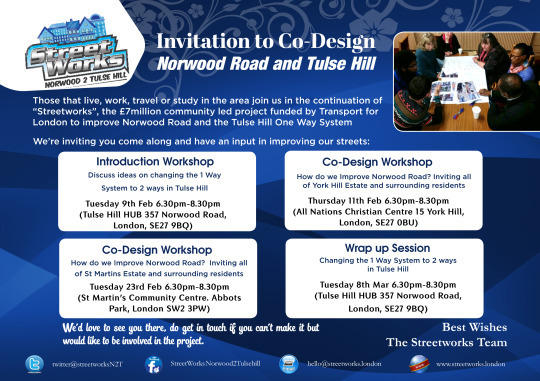 Tuesday evening is the next in the series of workshops to improve West Norwood and Tulse Hill and we hope that many of you will come and have your say. Streetworks grew out of a community petition to the Mayor of London to invest in improving streets in West Norwood and Tulse Hill. It has continued to be community-led and since the summer there have been monthly workshops to codesign changes to the neighbourhood. We have also helped to run and fund events and activities in the community – from a Wiggle and Rhyme picnic at the Old Library in West Norwood and a student-led project at Elmgreen School, to a Christmas party and discussion on the St Martins Estate and a tea party with the Norwood Pensioners’ Group. So far we have been focusing on Norwood Road and Station Rise. The next workshop will focus on the one-way system – please bring your ideas and aspirations! We have a real opportunity to transform our area and we need everyone’s input. Posted on February 1, 2016 by thurlowparklabourTagged gyratory, norwood road, streetworks, transport for london, tulse hill, Tulse Hill Station. Next Next post: Nominate your street!